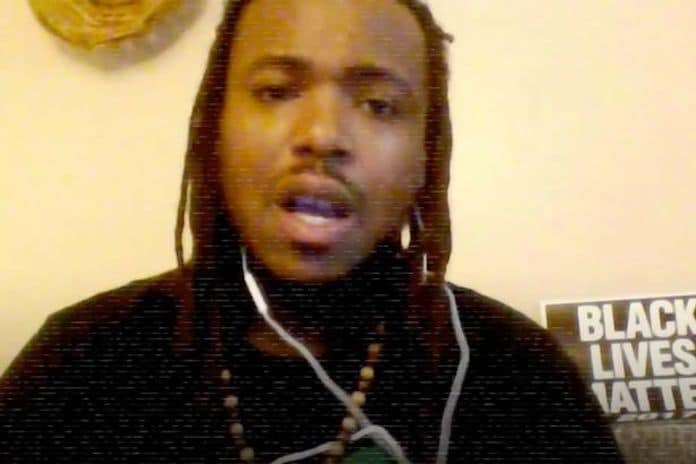 Pictured Black Lives Matter leader, Muhiyidin d’Baha, also known as Muhiyidin Elamin Moye. Muhiyidin d’Baha murder: Charleston Black Lives Matter activist mystery death. A targeted shooting or a random act? Black Lives Matter leader, Muhiyidin d’Baha, 32, perhaps best known for attempting to steal a Confederate flag from a protestor on live TV, during last year’s Charleston protests has died after being fatally shot in New Orleans, his family said. A report via the Advocate told of the activist who also went by his legal name of Muhiyidin Elamin Moye, or Moya, dying Tuesday morning, circa 9.30am, after being shot in the thigh while riding his bicycle hours earlier. A call to police after the sound of gunfire led to the discovery of the destabilized activist some two blocks where he had initially been shot, his bike soaked with blood, with police able to trace a flow of blood back to the original point of shooting. How or why the Black Lives Matter leader came to be shot remained unclear with New Orleans police spokesman Beau Tidwell saying no information about a potential motive or suspects was immediately available. Come Wednesday, no new information was made available as to whether the shooting in the generally crime rife city was random or targeted. The area of the shooting, along Bienville St close to the French Quarter, is well known for its prolific drug trade. Of note, Weaver said her South Carolina based uncle was in New Orleans for a personal trip. It remained unclear how Moye came to be riding his bicycle in the notorious section of the city and at the particular hour of his shooting. The activist rose to national prominence following an incident last February during the racially heated Charleston protests when he was arrested for jumping over a barricade in an attempt to grab a Confederate flag away from a demonstrator at the College of Charleston. Members of the South Carolina Secessionist Party had gathered to protest a lecture by activist Bree Newsome, who famously climbed the South Carolina capitol flagpole to remove its Confederate flag in 2015. Tensions had been escalated after the self-described Confederacy heritage defense and political activist group gathered to protest the permanent lowering of the flag on statehouse grounds, following the June 2015 murders of nine black churchgoers by convicted killer Dylann Roof at Charleston’s Mother Emanuel AME Church. D’Baha whose ‘defiant feat’ soon went viral drawing both praise and scorn, was charged with disorderly conduct charges following the incident. More than two years earlier, the activist was arrested after being removed from a North Charleston city council meeting for disorderly conduct after reportedly disrupting the meeting. Muhiyidin d’Baha Charleston Black Lives Matter activist: Killed by the very thing he sought to change? Following the activist’s death, a vigil for Moye was held outside of the North Charleston city hall, Tuesday night. Members of his family attended the event, where his activism around police brutality and racism was highlighted. According to the activist’s niece, Weaver told of her uncle moving to South Carolina from Poughkeepsie, NY, when he was 13 and committed to the cause of equal rights. As part of his activism work and dedication to asserting equal rights to the African American community, Moye organized rallies for civil rights along with demanding increased oversight of law enforcement after Walter Scott was fatally shot by former South Carolina police officer Michael Slager. The activist’s death comes in the face of there already having been 26 murders in New Orleans into the new year. A city known for its stark violence, poverty and disparate haves and have nots and entrenched racial and class structure. Total murders for 2017 came in at 157 deaths. In the hopes of bringing d’Baha’s body back to Charleston for a funeral, his niece started a GoFundMe drive that has since as of Wednesday noon, EST, raised $21,631 of a $7,500 goal.